a domestic disturbance: Lupines and Popcorn! I imagine that lupines are totally good for you so grab some from a street vendor - most popcorn vendors sell them but you'll probably have to ask - they'll likely be kept in a cooler. And help me start the lupines revolution! 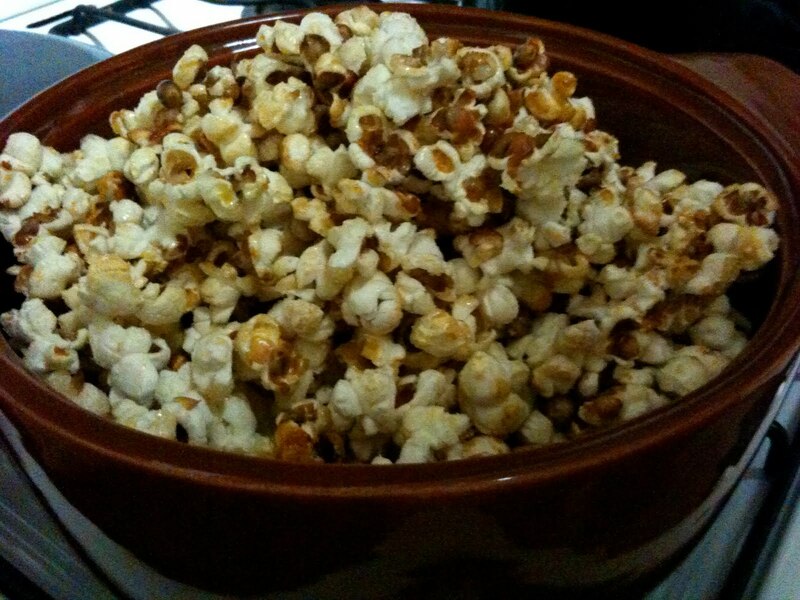 Eating popcorn in Argentina means eating a sweet, sugary snack. Pochoclo or pororo (not sure why there are two words) is made and sold by street vendors, and is impossible to ignore once you've smelled that delicious melting sugar. And you can make it at home using the old shake-it-over-the-stove method. I vaguely remember my mother making popcorn this way in the early 80s before an air-popper, and later microwave popcorn, took over. Heat oil over med-high heat in a large pot, add a few kernels and wait until they pop. Add all of the kernels and cover the pot. Once you hear popping, start shaking the pot across the burner, but allow it to rest on the burner for a few seconds at a time. Occasionally let out some steam. Once most of the kernels have popped add half a cup of sugar, cover and shake. Once the popping has slowed to one or two seconds between pops add more sugar (to your taste), lower the heat to medium, and stir continuously with a wooden spoon - allowing the sugar to melt onto the popped corn. You may need to remove from the heat, cover, and allow the sugar to melt before stirring again. 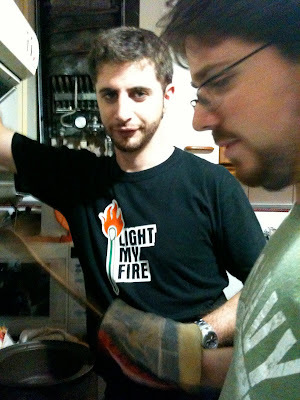 Also, Diego invites you to light his fire. i tried to make popcorn covered in honey once, baked it in the oven, hoping it would be like caramel corn but it didn't work. this sounds a little easier. Finally, a sighting of the elusive lupines! Thanks for posting this because I still haven't run into these things. I'm curious to try them. We had one of those air-poppers back in the 80s too! Those machines made good popcorn. Apparently, the people that live in and around the province of Córdoba prefer the word "pororo" while the rest of the country generally calls popcorn "pochoclo." Whatever you call it, it's yummy. Fun post! By the way, nice t-shirt, Diego! I just stumbled upon your blog and I'm really glad I did. 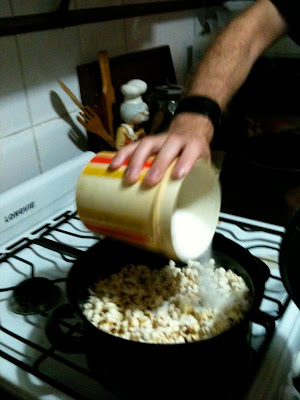 I relearned the art of stove top popcorn myself when I moved to Colombia 2 years ago. I'll have to try this recipe. Thanks for posting it!